The following is a fairly complete list over book publications of Holbein's original woodcuts. 1538: »Les Simulachres & historiées faces de la Mort, autant elegamment pourtraictes, que artificiellement imaginées«. The first edition with 41 woodcuts. The last page states that the brothers Trechsel were behind the publication: »Excvdebant Lvgdvni Melchior et Gaspar Trechsel Fratres. 1538«. The front page tells us that the book was printed »A Lyon, soubz l'escu de Coloigne«", which was the address of the brothers Frellon. Jean and François Frellon were sons of a Parisian printer, but Jean had later acquired citizen's rights in Basel. As of 1536 the brothers were established in Rue Mercière in Lyon at l'Écu de Cologne. Published by the brothers Frellon, who are responsible for the following publications, since the brothers Frellon had closed their shop following a strike in 1539. 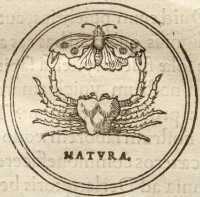 1542: »Imagines de Morte et Epigrammata e Gallico idiomate a Georgio Aemylio in Latinum translata«. 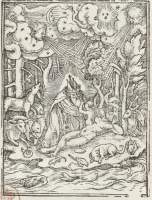 This edition has 42 woodcuts, since the beggar has been added. The beggar has nothing to do with the rest of the dance but appears in a different section of the book. 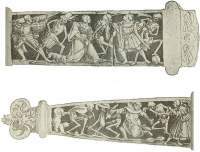 1547: »Imagines Mortis. Duodecim imaginibus præter priores, totidemque inscriptionibus præter epigrammata é Gallicis à Georgio Æmylio in Latinum versa, […]«. At the end: »Lvgdvni, Excudebat Ioannes Frellonius, 1547«, because François had died in 1546. Now there are 53 woodcuts and the beggar has become an integrated part of the series. The first word of the titles are different between this and the previous book ("Imagines" / "Icones"), and the whole text has been set anew. Other than that these two books are identical. 1547: »Les Images de la Mort. Auxquelles sont adjoustées douze figures. […]« The book was printed »A Lyon, A l'escu de Cologne, chez Iehan Frellon«. Unlike the two previous versions that were in Latin, this one is in French. Other than that the contents are the same. 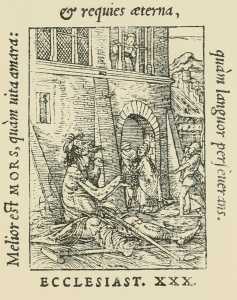 Italian version with 53 woodcuts. In the preface Jean Frellon complains about the pirate edition of Vincenzo Valgrisi, but Frellon got his revenge by copying Valgrisi's Italian text for his own edition. The title claims that this edition was printed in Basel, but doesn't specify which publisher/printing house. The question is whether the woodcuts were really sent to Basel and back, or if the place of printing was forged in order to avoid censure. This was the last edition. This time there are 5 more woodcuts — or as the sub-title says: 17 ("dix sept") more than in the first edition. The title page says, »A Lyon, Par Iehan Frellon, 1562«, but is wasn't printed by Frellon, who had sold his presses by this time. The last page states: »A Lyon, Par Symphorien Barbier«. 1574: »Imagines Mortis : item epigrammata è Gall. à G. Æmilio in Latinum versa. Lugdun. Frellonius«. This edition probably doesn't exist. Douce (page 109) gives Peignot as his only source, and Peignot (Recherches historique et littéraires sur les danses des morts, 1826, page 62) says that M. Courtois had such a copy. The only reference then is a catalog over Edme-Bonaventure Courtois' library from 1819. Douce is probably right when he suggests (footnote 114) that two numbers have been exchanged and that the book in question is one of the three editions from 1547: »This edition is given on the authority of Peignot, p. 62, but has not been seen by the author of this work. In the year 1547, there were three editions, and it is not improbable that, by the transposition of the two last figures, one of these might have been intended«. 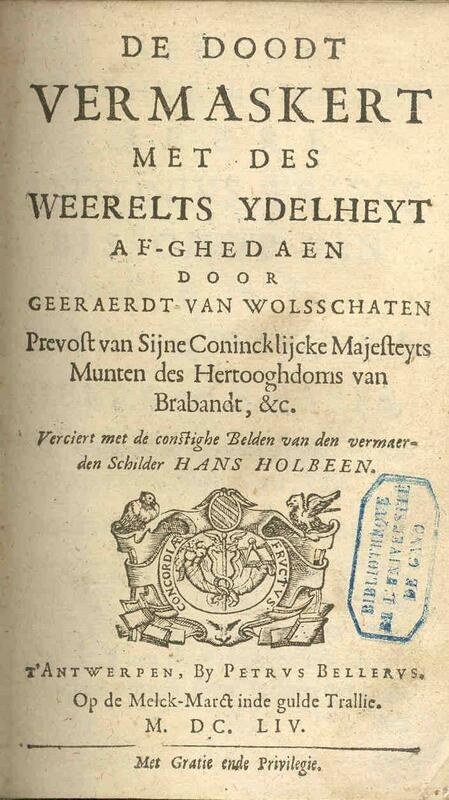 1654: »De Doodt vermaskert met des werelts ydelheyt afghedaen door G. V. Wolsschaten, Verciert met de constighe belden van den vermaerden schilder Hans Holbeen«, Antwerp. A Dutch language book with 15 good copies of Holbein's original woodcuts. Some experts consider them to be genuine, but I don't believe that (any longer). inding Holbein on the Net is easy, but in the majority of cases the "genuine" Holbein woodcuts turns out to be the copies produced by Douce in 1833 (or rather: 1858). All their qualities untold they are still copies with inevitable differences — particularly in the facial expressions. Finding genuine Holbein is a great deal more difficult. The Internet Archive and other collections offer scans of various photographic reprints from the 1800's. While they are not bad, the photo-technique of the 19th century leaves something to be desired; Google Books has many of the same books, but the books are badly scanned; Bibliothèque nationale de France has scanned the original books directly, but some of their scans are so bad they make your eyes hurt. 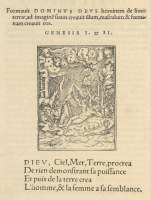 The Internet Archive has scanned the original 1538-edition: Les simulachres & historiees faces de la mort, autant elegamme[n]t pourtraictes, que artificiellement imaginées. 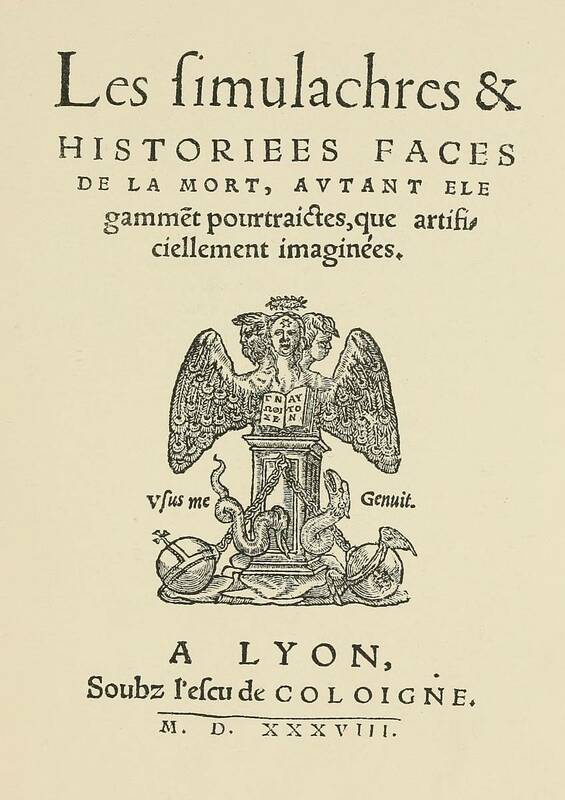 The Internet Archive also has 26 of the original woodcuts from an edition from 1547 or later: Les simulachres & historiees faces de la mort, avtant elegammet pourtraictes, que artificiellement imaginées (the exact title is unknown). 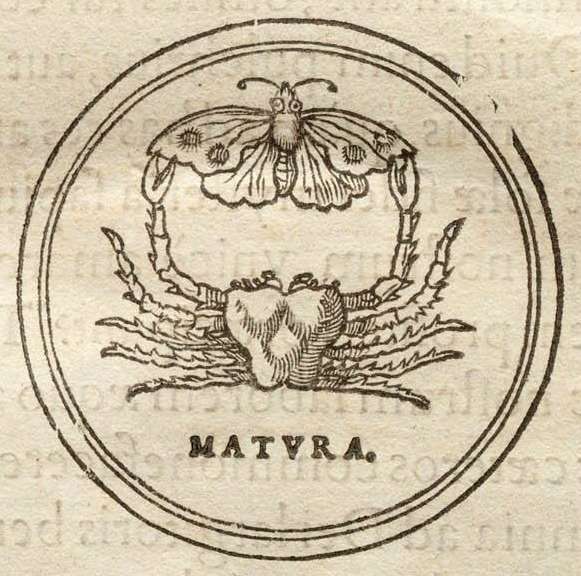 The Internet Archive has the Italian edition from 1549: Simolachri, historie, e figure de la morte (included in this exemplar are the 30 plates by Hollar of unknown age). 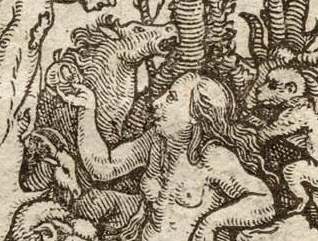 The Internet Archive also has several books from the 1800's with photographic reproductions of Holbein's original woodcuts (use their search function and look for "holbein" or "dance of death"). 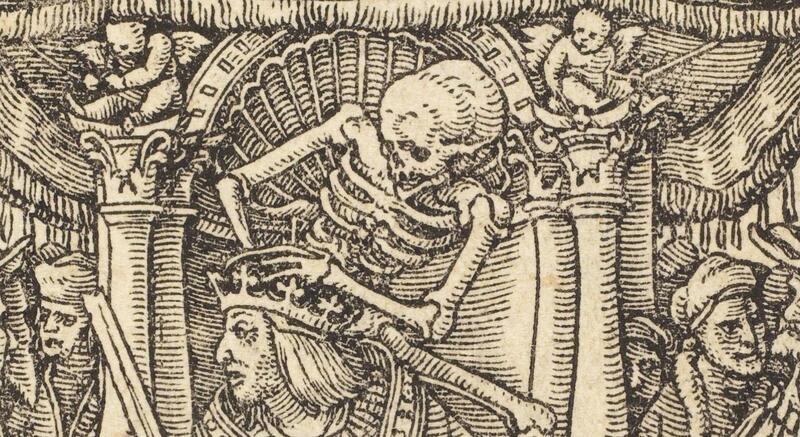 Bibliothèque Nationale de France has scanned the 1538-edition in high resolution, which can be viewed online: Les Simulachres & historiees faces de la Mort. The University of Düsseldorf also has several photographic reprints from the 19th century. 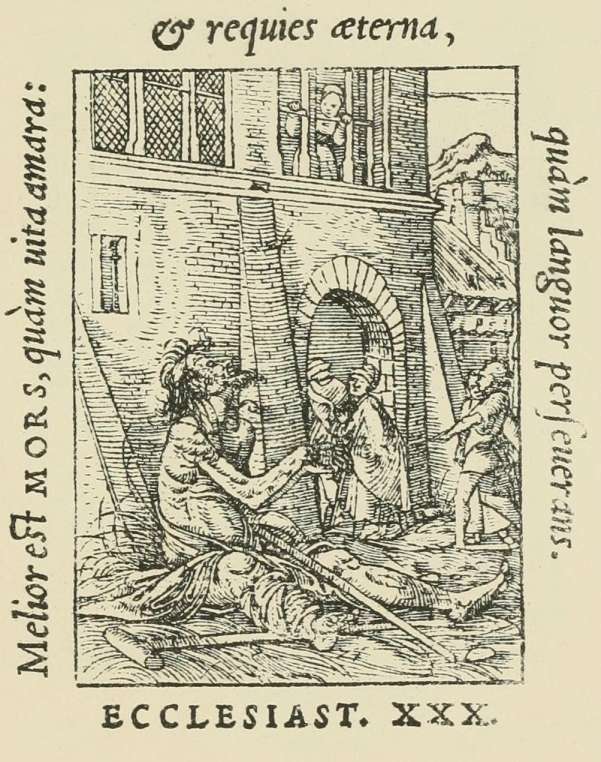 The Biblioteca digitala in Cluj-Napoca in Romania has the 1554 edition: Icones mortis : duodecim imaginibus praeter priores totidemque inscriptionibus, praeter epigrammata : qvae his addita sunt, sequens pagina commonstrabit (download as a 41.69 MB pdf-file). 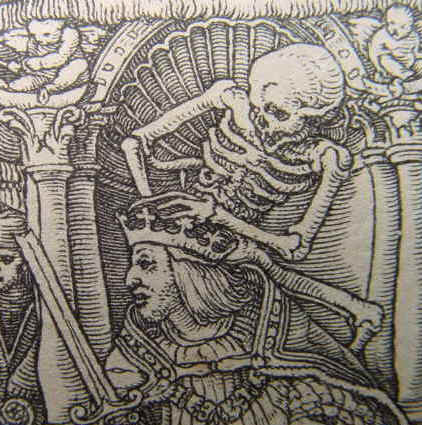 Holbein's Pictures of Death and the Reformation at Lyons - by Natalie Zemon Davis. Lots of background about the brothers Trechsel and Frellon. Georg Aemilius . 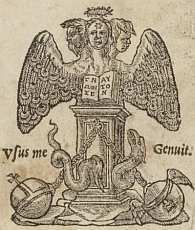 . .: 1517-1569, (also called Oemmel, Aemylius, Emilius, Öhmler and Oemler). Several authors claim that Georg Aemilius was Martin Luther's brother-in-law, but this is incorrect. It was Georgs father, Nicolas Oemeler, whom Luther called his boyhood friend and brother-in-law — and brother-in-law should be understood in a very broad sense, since Nicolas Oemeler and Luther's brother Jakob had married two sisters.